Four Greek Cypriot primary school students around 9-12 years old age are accused for throwing bombs to their school on the 5th of Aptil. Their issue will be taken into court on 11th of July. 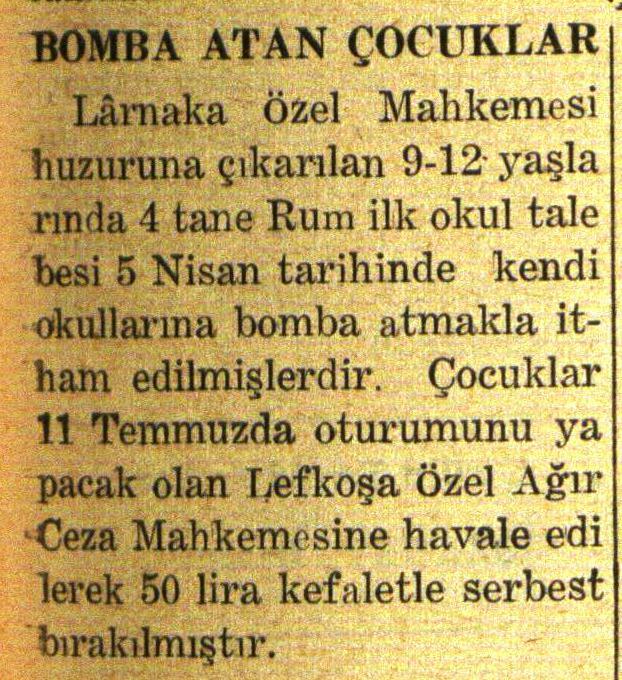 9-12 yaşlarında dört Rum ilkokul öğrencisi, okullarına bomba atmakla itham edilmiş olup, mahkeme 11 temmuzda görülecektir. H.K., “Children who Threw Bombs,” Cyprus Critical History Archive: Reconsidering the culture of violence in Cyprus, 1955-64, accessed April 25, 2019, http://ccha-ahdr.info/items/show/1051.